Ataribox: A New Way To Play Retro Games | Nerd Much? Much like Nintendo’s NES mini classic, Atari is getting in on the cash grab too. After being teased a little while ago, we finally have some more details as to what exactly Atari has been working on all this time. 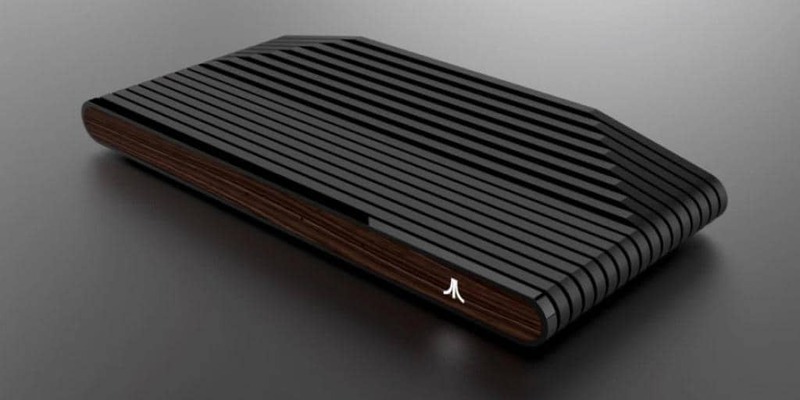 According to VentureBeat, there are two different designs for what Atari is calling the Ataribox. The first has the wood-grain siding we admired in the teaser video, and the other is a much more modern looking black box with a red logo and red on the back. As described Atari themselves, the new design was “inspired by classic Atari design elements” with a smoother and more seamless product in the end. The front, as previously mentioned, is either wood or glass depending on the model. Indicator lights will glow through both materials and include HDMI, SD, and four USB ports. Atari says that they intend on releasing both versions, and if you haven’t guessed already with the HDMI clue, the company plans on releasing both classic and current gaming content. The company states that we’ll be hearing more from them in the coming months, with regular updates as the feedback from fans comes in. So be sure to hit the social medias and let Atari know what you think so far and what you’ll want in the future. It’s certainly been a bumpy ride for Atari, since they claimed bankruptcy back in 2013 and bought out by Chesnais. A company that has managed to successfully breathe life into Atari’s ashes through a profitable market in mobile games. And of course, quite the ad campaign in the upcoming film Blade Runner 2049. you may have noticed the logo appear in every trailer for the film. Which games do you hope to see on the Atari? Which new games do you think they will put on there? Let us know in the comments below!